A few weeks ago I did a presentation at my daughters school about the history of computing. I talked about the invention of the first computer ‘Bug’, about chip density and exponential growth and how we ended up with the QWERTY keyboard layout. These were all 8 to 10 year olds so I had to come up with a lot of anecdotes and graphic examples to get my information across. Both the students and teachers were amazed however when I told them about the history of the QWERTY layout. 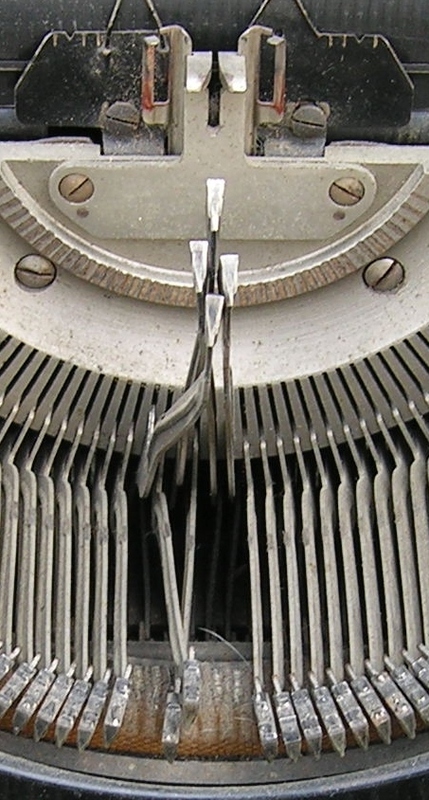 Characters were mounted on metal arms or typebars, which would clash and jam, so the keyboard was designed to minimize chances of two keys being typed right after each other. In effect it meant that the keyboard is designed to slow down your typing. The QUERTY layout still dominates even though with a computer you wouldn’t have to worry about metal arms getting tangled up. You could decide to make the switch to the DVORAK layout. It is an optimized keyboard layout that is easier to learn (students who learn DVORAK do so in one third of the time it would take to learn QWERTY) and will allow you to type a lot faster. Matt Mullenweg uses DVORAK and so does Steve Wozniak. I thought about switching too. I have been working with computers daily since 1990 and still type with just 3 fingers. Switching to DVORAK might make sense for me. Somehow I feel that if I hold out a little longer I won’t have to use keyboards at all. With the introduction of the iPad and iPhone, the touch interface has replaced the keyboard and mouse as the best way to interface with computers. When I installed Keynote on my iPad I didn’t believe I would be really using it. I figured making presentations would be cumbersome without a keyboard and mouse. It turns out that it is the other way around. The multi-touch interface makes interacting with documents a lot easier and more intuitive than using the keyboard. Rotating images, scaling them and copy pasting them is just so much more easy when you use your fingers. What remains to be seen is if the iPad will be a one-off success or that Apple, and other manufacturers will adopts touch-screens across the board. iMacs and MacBooks with touch-screens? Why not? In fact, the current line of screens that Apple offers looks outdated and expensive. I wouldn’t be surprised if all future Mac screens have touch-screen capabilities built right in. So, will we really get rid of keyboards soon? Guess not. Voice input is too cumbersome and brain-to-computer interfaces are still in the early concept phases. Although touch-screens force us to rethink the way we use computers it won’t relieve us from the keyboard just yet. After all, even a keyboard onscreen is still just a keyboard.